In their study, conducted at Hilti AG, Hestatt and Von Hippel involved 12 experienced constructors to redesign pipe hangers and in a 3 days workshop, that involved both lead users and Hilti employees they come out with a new concept halving the costs of traditional approaches: with a traditional approach, it would have taken 16 months and $100,000 to develop a new concept, produce and evaluate it. Adopting the lead users approach, the time and costs of conceptualising, producing and testing a new product were respectively of 9 months, and $51,000. It’s about having a representative sample of all actors involved: users, designers, marketing managers, technology experts, creative people – and to give them the tool to co-create, leading them to share and generate ideas collaboratively, through constructive interactions and processes that can produce results. Although the experience described by Hestatt and Von Hippel is not labelled as co-creation, since the term dates back early 2000, this was an experience of co-creation: participative, social, creative, collaborative and interactive. Co-creation is a process finalised to produce new ideas capitalising on collective creativity, not a marketing or communication tool to collect countless suggestions. That makes the co-creation experiences less visible to the media, compared to crowd sourcing and contest-like experiences; yet, the results and the efficacy of this process are seen in the products and ideas that are co-created with benefits on the long term on the brand. Co-creation requires the involvement of people in teams, and it’s a process that is enhanced through well designed activities that aims at unleashing individual creativity in a meaning sharing, sense-making, decision-making collective experience. The co-creation process always begins with understanding a need and in framing properly what are the expected outcomes of the work. Understanding is based on the context and existing research, while the research phase uses all sort of methods, i.e., interviews, ethnographic research, personas, focus groups, contextual inquiries and web analytics to get a clear understanding of the problem. Ideation is the early stage of the co-creation process and it involves users in sharing their initial ideas. It involves a mixed group of participants, made by users, stakeholders, and designers. The key activities are making random connections and brainstorming, to explore the problem in all directions. The forth phase is where co-creation happens, and it’s the co-creation workshop. A workshop focused on making rather than listening, where all participants collaborate and contribute to find and create ways to address the needs through creative, knowledge sharing and constructive activities where the team is invited to negotiate and agree on the best solution that satisfy all stakeholders. Because co-creation involves meaning making, negotiation and consensus from small groups composed by customers, users, designers and stakeholders a number of facilitation techniques and approaches are required. The need for facilitation methodologies and a facilitator is due to the fact that they will help guiding participants from the scenario planning to collective decision-making and to design and define a new idea. ButterflyWorks mentions a number of techniques, i.e., mapping the ecosystem, urgency axis for prioritization, various stickers based and brainstorming techniques. Once the team defined the solution, the designers are in charge to develop the idea in a more advanced stage by keeping in touch and asking for ongoing feedbacks from the participants, through various means, including more workshops. The co-creation process ends with participants testing the pilot. A concrete example, comes from Argentina. Here, one energy company LatAm, decided to redesign their building. To achieve this, they decided to co-create the new design involving all people who works and interact with the building and the offices, from CEO to cleaning teams. 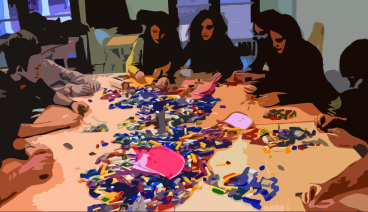 They called in a LEGO Serious Play facilitator and worked together analyzing they key issues of working spaces and doing research on ergonomics and space management. After the analysis and the research, the facilitators designed the workshops involving 80 people in several workshops to understand work dynamics, needs, values and concepts that are meaningful for participants. The initial design was then presented and discussed with participants and the experience ended with the building of the company new offices in Buenos Aires in 2011. Although this was an internal co-creation experience, involving all people sharing the space of a building with various functions and roles, the process was a pure co-creation approach. LEGO Serious Play is one of the many facilitation techniques that engage and commit participants, but any good facilitator can design workshops based on the techniques they are familiar with, like World cafè. Any creativity and making based approach can be used, given that the premises and the co-creation steps are maintained and the goal is shared. Because co-creaiton is an approach. It’s a way to enhance the dialogue and exchange with the market, the customers and bring the Cluetrain Manifesto into life. Herstatt, C. & Von Hippel, E. “From Experience: Developing New Product Concepts Via the Lead User Method: A Case Study in a “Low Tech” Field”, Journal of Product Innovation Management, 1992;9: 213-221. Searls, D., Weinberger, D., Levine, R. , & Locke C. (1999) The cluetrain manifesto. Verhoef, P.C., Sander F.M. Beckers S.F.M, & van Doorn J., Understand the Perils of Co-Creation. In: Harvard Business Review. http://hbr.org/2013/09/understand-the-perils-of-co-creation/ar/1 September 2013.